Feeling burned out but don’t see yourself selling your business or changing careers/jobs anytime soon? Are you an overachieving, multitasking perfectionist who tries to keep some balance in life? Do you ever wonder how stress is affecting your productivity, relationships, and health? You are not alone. The Chamber’s NB Business University will host a seminar on Thursday, July 13th to help business leaders and entrepreneurs stay motivated, fired up and excited before exhaustion and lack of interest set in. 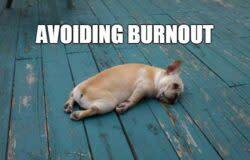 Avoiding Burnout will be presented by Dr. Rob Konopaske from 11:30 a.m. to 1:00 p.m. at the Chamber in Honors Hall. Tickets are available at www.LearnInNewBraunfels.com. Come learn from Dr. Rob Konopaske – organizational behavior specialist, entrepreneur, writer, professor, husband and father – on how to stay engaged, sane and (somewhat) balanced while integrating your professional and family lives. You’ll walk away with tips and techniques to apply to your own situation to avoid burnout and stay fired up.